The neighborhood of Tierra Granda/Tehama is one of the most prestigious Carmel neighborhoods to call home. Located in Carmel Valley it is an area of unrivaled natural beauty with magnificent estates with hilltop views of the ocean, mountains and fairways. The name Tehama is derived from the Native American word meaning “abundance of nature.” Once you experience the beauty of Tehama you will realize what a perfectly appropriate name it is to capture the essence of this special land. Developed by Clint Eastwood and guided by his philosophy of sustainable real estate, the community offers limited homesites and property for sale that will no longer be further developed in order to preserve the land and environment. There are ninety custom homesites, half of which are still available and start at $2.5 million. The size of the sites ranges from 3.5 to 20 acres. To ensure that each home is designed and built in harmony with its natural surroundings and in accordance with the goals of the community, the Design Review Committee is actively involved in working with homeowner’s vision in collaboration with their architects, landscapers and interior designers. The community strives to create homes of great quality and craftsmanship, with timeless appeal to leave a lasting legacy for generations of owners. Sustainable building materials and renewable energy implementation are strongly encouraged, and each home site’s surroundings and vegetation are considered to seamlessly integrate the environment with the home. There are a variety of architectural styles to choose from and the rich influence of Spanish, Western and ranch styles are incorporated into the design. Tehama is protected by two guarded entrances, from Carmel Valley to the south and from Monterey to the north. Looking westward to the coast you will have blue majestic ocean views of Point Lobos to Monterey Bay and beyond. Your eastern view transports you to the Santa Lucia Mountains. 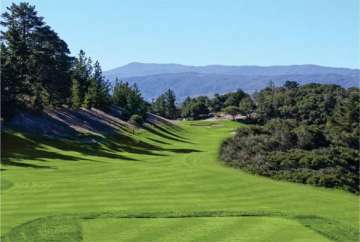 Tehama Golf Club is a private, invitation only golf course designed by Jay Morrish. High above the Carmel Bay you can challenge yourself to an unforgettable game of golf, then later enjoy an exceptional meal at the hilltop Clubhouse. The saloon offers casual dining and more formal dining events are held in the private dining room. The Club also has a full service Pro Shop for members with complimentary continental breakfast each day as well as their signature treats like homemade chips and freshly baked cookies. Click here to preview all Carmel homes for sale in the Tierra Granda/Tehama neighborhood. For all available Carmel Valley real estate, click here. In 2018, 5 homes sold in this neighborhood. The most expensive home to sell was a 3 bedroom, 4 bathroom home with 3,200 SqFt of living space on a .78 acre lot with a 490 SqFt guest house and selling for 2.2 million. The least expensive home to sell was 2 single family home dwelling property with the main house being 3 bedroom, 2.5 bathrooms with 1,331 SqFt of living space and a 516 SqFt other home and selling for 872K. In 2017, 11 homes sold in this neighborhood. The most expensive home to sell, sold for 1.298 million for a 3 bedroom, 2.5 bathroom home with 2,959 SqFt of living space on .62 acres with panoramic valley views. The least expensive home to sell, sold for 760K for a 2 bedroom, 2.5 bathroom, mid-century home with 1,880 SqFt of living space on 1.17 acres. In 2016, 5 homes sold in this neighborhood. The most expensive home to sell, sold for 3,012,500 for a 3 bedroom, 2 full and 2 half bathroom, gated, country retreat with 3,701 SqFt of living space on 2.68 acres. The least expensive home to sell, sold for 845K for a 2 bedroom, 2 bathroom, charming farmhouse home with 1,600 SqFt of living space on 1+acres. 2 homes sold in this neighborhood in 2015. The most expensive home sold for 1.3 million for a 2.58 acre lot that features two properties; the main house features 4 bedrooms, 3 bathrooms and 2,425 SqFt of living space, the second cottage features 2 bedrooms, 1 bathrooms with 1,125 SqFt. The least expensive home sold for 1.15 million for a 3 bedroom, 2.5 bathroom, single story ranch style, 2,225 SqFt home on an acre lot. There were 2 homes sold in this neighborhood in 2014, the most expensive home sold for 1.15 million for a 3 bedroom, 3 bathroom, 1,656 SqFt home on a 4 acre parcel while the least expensive home was a 2 bedroom, 2 bathroom custom built home with 1,954SqFt of living space on about an acre that sold for 810K. In 2013, 3 homes sold in this neighborhood. The most expensive home sold for 3.195 million and was a 6,100 SqFt home on 7.6 acres of land, while the least expensive sold for 665K and was a 1,648 SqFt home located on 44,431 SqFt of land. To live in Tehama is to live in one of the premier luxury communities on the Monterey Peninsula. Your custom home is constructed on the finest materials, stone and woodwork, soaring beamed ceilings, windows that frame the inspiring outdoor views. Situated on acres of land you will have a sense of privacy and refuge, yet you are never too far away from all of the amenities of Carmel living. You will have the opportunity to join and enjoy the Tehama Luxury Golf Club for a world class golfing experience and the Social Fitness Center for health and vitality. Your close proximity to the storybook charms of Carmel-by-the Sea will provide you with endless shopping, dining and recreation opportunities. A drive through Carmel Valley with the warm sun, sprawling equestrian facilities and fields of lavender among the shady oaks will inspire you. You will enjoy the numerous wine tasting rooms as well where you can sample superb local wines in a casual and relaxed atmosphere. Wherever you venture from the beaches of Big Sur, the golf courses of Pebble Beach or an excursion through the Carmel Valley, returning to your home in Tehama you will be entering a tranquil oasis. Nature is preserved in timeless beauty and your hilltop retreat sits in perfect harmony with its surroundings. What a treasure to live in this idyllic community.